We are about to begin living off the grid and we have All. The. Emotions. We are back in NZ on the cusp of a whole new thing. Because on Saturday we move on to our new land, putting up our first little yurt next to a beautiful stand of native Kahikatea trees, ready to begin cultivating a huge veggie patch, a few orchards, and a life of wild learning and growing together. We popped in there yesterday, our first day in NZ and as we walked around there were two little piwakawaka (fantails) flitting around us, chirping and swooping and it just felt like they were giving us a little welcome, saying, make your home here with us! It is a bit surreal to think we are well and truly becoming farmers now, living off the grid using solar energy and our stream for water. Over the next few weeks and months we have to build our own composting toilets (read about golden poos right here) and bathroom, we have to tap the springs so we have fresh water, put up our bigger, mammoth yurt, find places for our chickens and cows, and start planting out the food that will fill our bellies. After a few months of travelling around (still planning posts about Paris and other adventures – i have been a bit distracted all summer by writing my new booooook) it feels so, so, so good to be grounding ourselves, embracing rituals and rhythms, connecting with the community of kindred spirits we have in NZ – in particular the family we are sharing the land with. 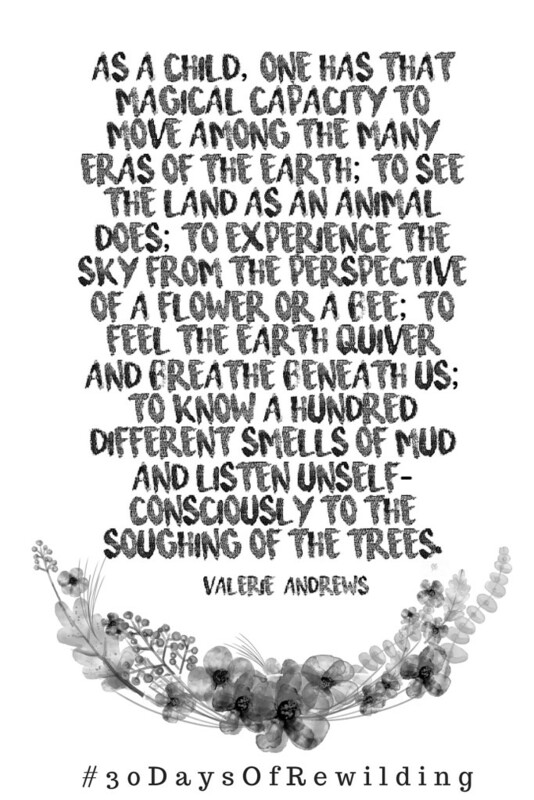 I can’t wait to be a part of Ramona and Juno’s learning journey as we learn together on the farm, through simply living and responding to creative urges and engaging with the natural world around us. I feel so happy to imagine this childhood for our kids, one filled with bugs and mud and native birds and forest, one where they won’t lose touch with their wild selves. And then, amongst all this huge sense of anticipation and happiness are these random pangs of sadness. A memory from this summer, of swimming in an English river with my lifelong best friends or laying down in the long grass to watch the meteor shower with my beautiful sister, will shoot into my mind and just take my breath away. And, underneath all these feelings, the grief and joy and hope, is this sort of intangible fear. It feels funny to type that out. To name it. But there it is. It is a quiet vibration just humming amongst it all. Because we can’t separate what we are about to do from all the horror stories of intentional communities we’ve heard. We can’t deny the fact that are not born farmers, or that we are all stepping out of our existing community of marvelous hippies to do this together. But it isn’t the scary kind of fear. Because we know, know, KNOW we have to do this. And we are certain we want to start living off the grid with others. We have always yearnt for interdependency and life-sharing and are convinced that sustainable living looks like this. We didn’t want to grow old wishing we had taken a chance on nurturing a tribal way of life when we had it. And if we can do this with anyone, it is with the family we co-own the land with. 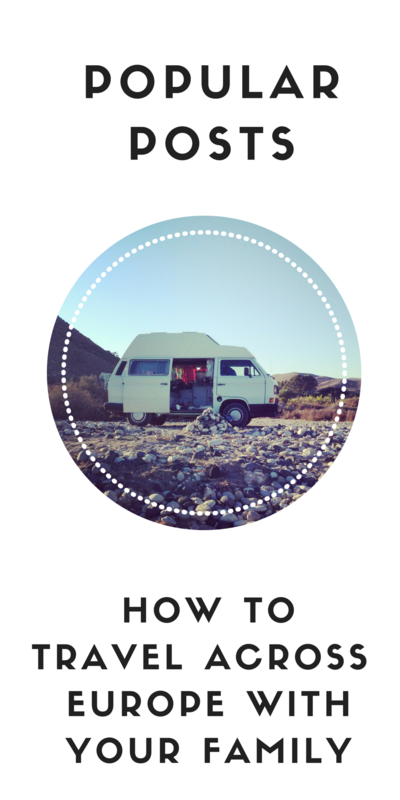 Living off the grid beckons! The baby elephant swung its thick grey trunk over to Ramona, moving his snout across her body while she ripped the sheath from a corn cob. Before she could hand the sweet corn over, another trunk, this one about 8 times the size, reached over her shoulder and pinched it. Grandad elephant, with his big gnarly tusks, doesn’t get the snacks after the whipper snapper, thanks very much. It was magical, getting up close and personal with these jungle beasts. There was a crowd of them right next door to where we were staying, a motel at the foot of the mountains outside of Chiang Mai, Thailand. We’d wake up to the sound of them trumpeting to each other as their mahouts got ready for the day ahead. We followed them on a little trek, Juno shouting POO! POO! most of the way because, turns out, the jungle is where they do most of their biz. We were even there for the precious moment when the baby elephant did a sneeze and farted at the same time – such a classic. We were all completely delighted! As we spent more time there, we watched them carry tourists around the jungle, splash in the river on command and pose for a photo. And we were left pretty saddened by it. 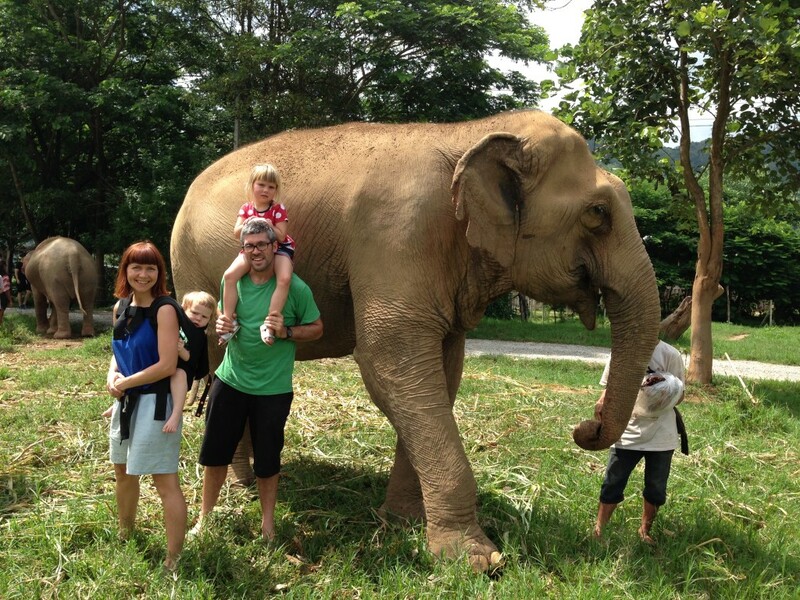 It wasn’t really at all what the website portrayed it to be with it’s “Keeping Elephants Alive” slogan…. Keeping them alive, sure, but shackled and controlled. It is incredible standing next to one of these magnificent creatures, but you also feel like you’re not really meant to. They are meant to be crashing around a dense jungle, stampeding together, getting furiously protective of their babies, not chained too many metres away to even stroke them with their snout. We still enjoyed our time in the foothills of the Chiang Mai mountains- we visited a waterfall and ate our weight in tropical fruits. 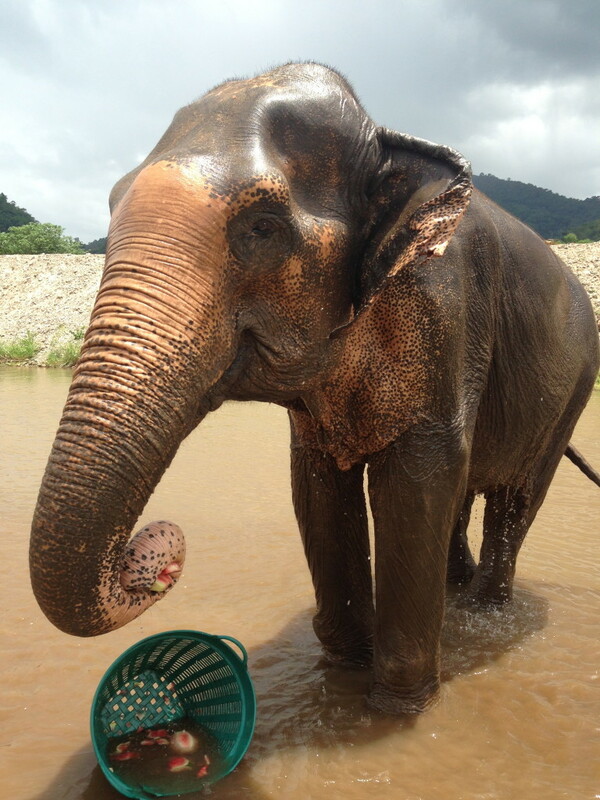 But it was with relief that we got in to the city, where we didn’t feel accused by the neighbouring elephant’s eyeballs. There are over 40 elephants spread around 300 acres, and they aim to try and rehabilitate some into the jungle where possible. There is no riding, no shows, humans are the ones that have to step back when an elephant goes where it wants to go – it was perfect and totally soul-lifting. We only had 8 days in Thailand so tried to tick off a few Must Dos – i.e a massage. Mine was done by a blind man, a member of the Association for Blind Massage, a Chiang Mai social enterprise. It was completely brutal. Sheesh. I almost cried – except that I didn’t want the big Thai lady getting a massage next to me, who did huge, smelly burps every time her masseuse rubbed her back, to think I was a wuss. But I did feel about an inch taller afterwards. 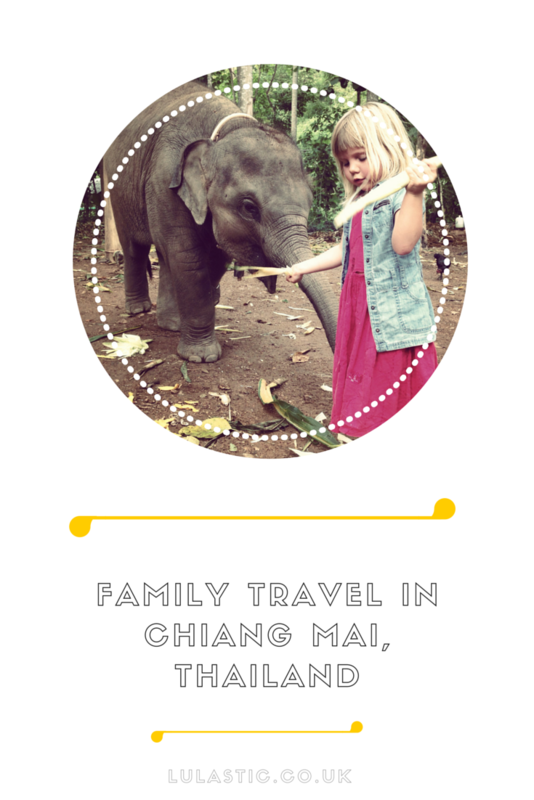 Less of a typical “Thailand Must Do”, but a major “Our Family Must Do” was a visit to the local Chiang Mai flea markets. Unexpectedly enormous and filled with old delights, the Prince Royal College secondhand markets were full of proper Asian antiques, and – the stuff I love- a load of manky household crap. BRILLIANT. I bought, get this, a big Pestle and Mortar. Hahahahaha. It weighs 8 kilos. Exactly what we need in our suitcase at the start of a 3 months travelling adventure. I was like; BAG IT MY FRIEND! We spent our first few days feeling sad about chained up elephants and also being extremely jetlagged and basically all really mad with each other. But by the end of our time there we were just floating on a massive Pad Thai buzz. Happy that we had spent our baht on some good, ethical stuff. What is the trick to finding good ethical tourism? I don’t have lots of great answers. This week showed us just how entangled the industry is with untruth and propaganda. Research as much as possible online (we didn’t touch the local tiger place as I’d read about some awfully cruel practices there), talk to lots of people on the ground, make one or two choices to support local social enterprise. But mostly, realise that travelling is less about ticking off all the “Things To Do” and more about being in a place, eating the food and talking with people. That is where the real experience is to be had. I reckon. Like, if we’d filled up our days with all the suggestions of visiting exotic, caged creatures, how would we have found ourselves perched at the foot of a two storey marble cat with a moustache and a handbag, drinking the yummiest mango smoothies ever? We are off! 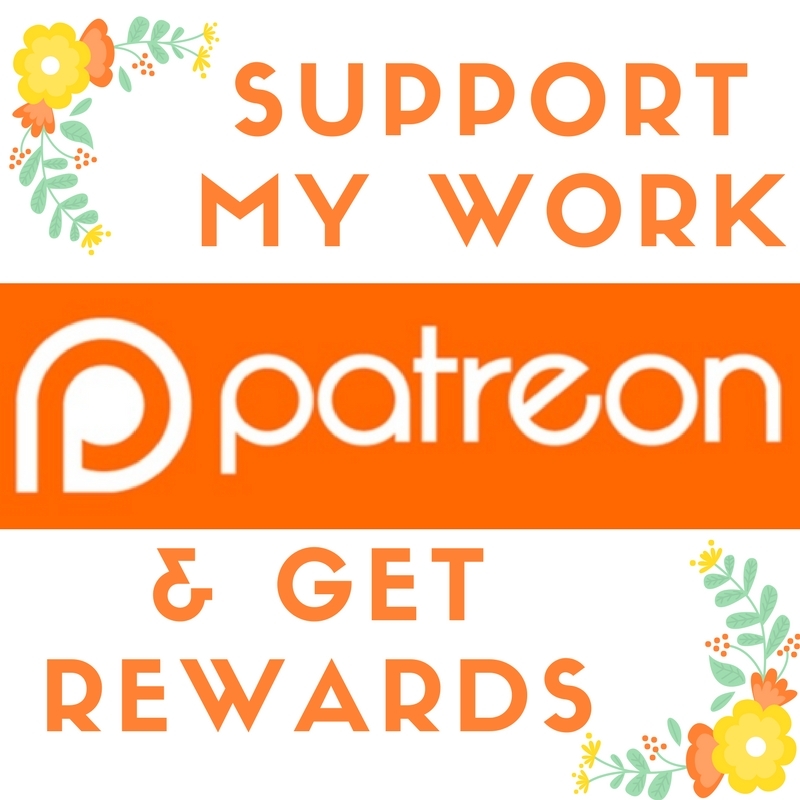 We have 15 minutes to go; Tim is making last minute coffees, the girls are bouncing around in the corner simultaneously wrestling and playing Mummies and Daddies (this involves Ramona giving birth to Juno over and over again) and I am doing a sneaky little blog. These sum up our priorities EXACTLY. We are facing down a 12 hour flight to Thailand, the start of a three month trip that involves frolicking with elephants in Chiang Mai, touring about the UK with our friends and family and then a whizz through San Fran. HOORAY! 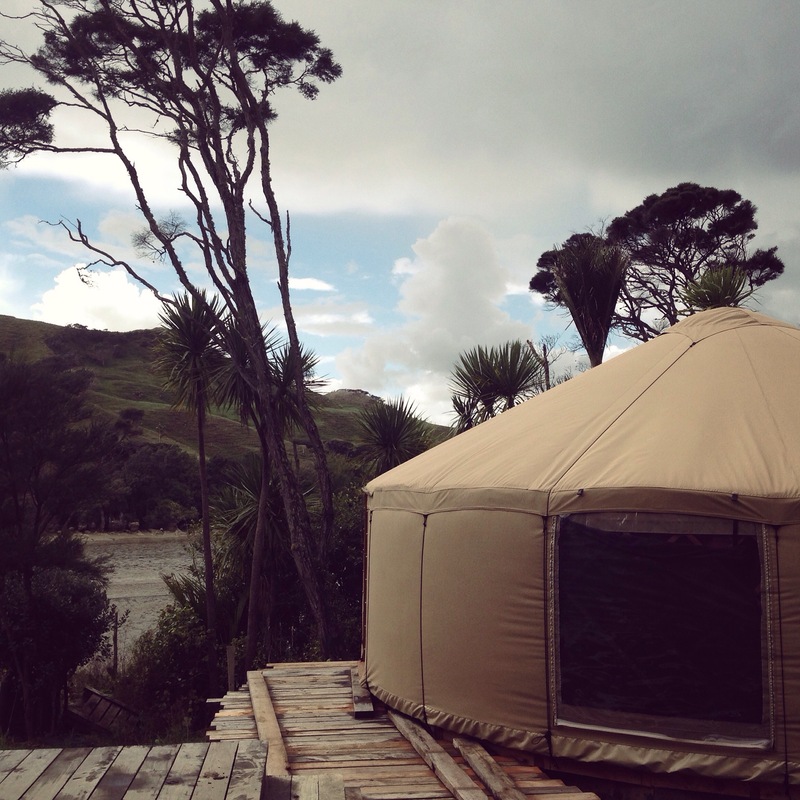 We have packed down our little yurt and said cheerio to all our beautiful friends in the Coromandel, for when we get back to New Zealand in September we are going to be moving onto our new land! ARGH! I am generally excited about everything right now, this is obvious in how short my fringe is getting- I’ve come to understand that when I am buzzing out a little I tend to gravitate to the mirror and cut my hair. THESE ARE HAPPENING! SO cool! 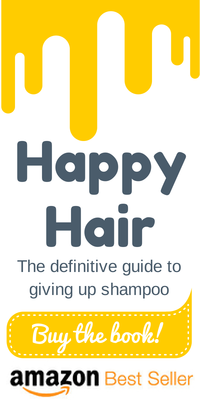 They are open events, everyone is invited, I will be talking through the world of giving up shampoo and toxins and covering other Hippyshake kind of stuff. I did the last New Zealand one of these a few weeks ago, 75 people came and we had an absolute BLAST. So much fun. Please do come! Find the Bristol event here and the London event here. 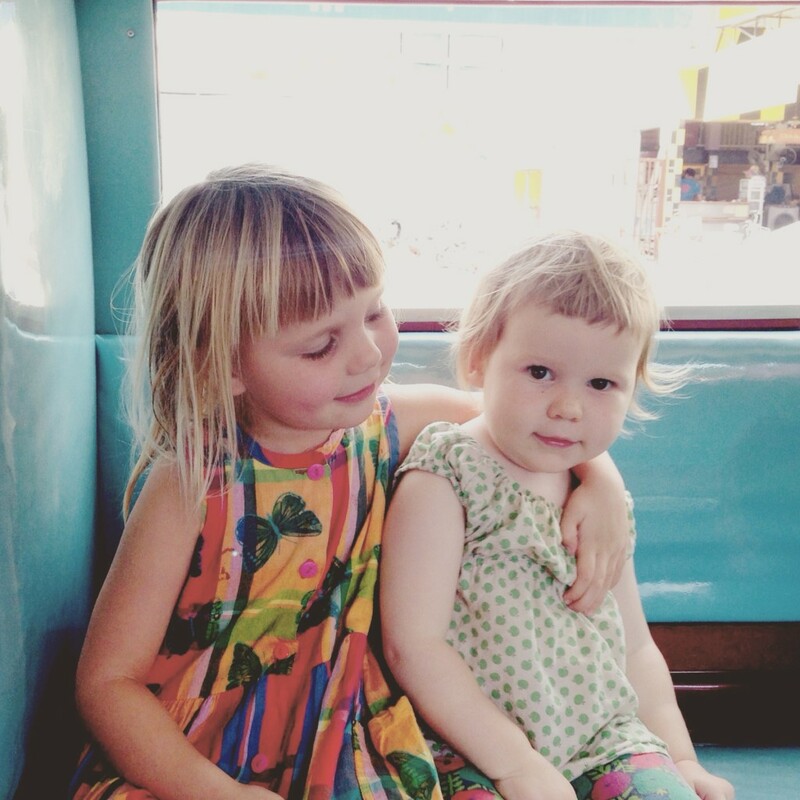 One of the funnest weekend in our family’s life was when we took Juno and Ramona to Camp Bestival just before taking off around Europe in our campervan. There is incredible music, stack loads of creativity, an enormous arts and crafts tent; just this weird little universe of families all letting loose together. I saw a sign there that year, scrawled by a mum, “Families who festival together stay together” – it makes up in truth what it lacks in rhyme. 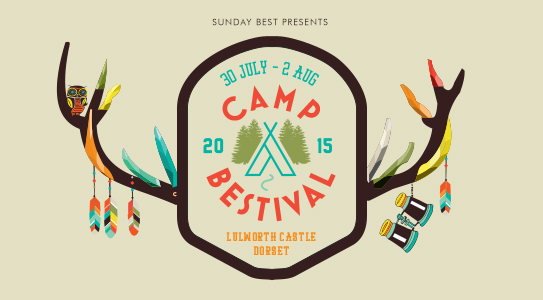 Annie here has the full download- everything you need to know and here is the Camp Bestival site itself. It sort of feels like for the next three months we are going to join that tribe of digital nomads, families blowing on the breeze, lives made possible by the Internet. Last, but not least (cos GOSH that would be offensive!) SEEING OUR FRIENDS AND FAMILY! About 7 million of my friends have had babies while we have been away, so of course, I CAN NOT WAIT to meet these new souls. And my nephews and niece have grown up into giants so I need to do some serious playing of Hide and Seek and Ninja Mermaids and stuff with them. I get the tingles when I think about crunching all these people I love up! I stuck my head out of our door to call the kids in for tea a few days ago. Ramona and Juno and our neighbours had been playing on the 6 foot high mud pile outside our house so I was expecting a bit of dirty wreckage…. I wasn’t expecting one of the boys to pop out of the sludgey mountain completely and utterly covered, from scalp to toe. The whites of his eyes shone out of this thick, black, magnificent dirt. They were playing mud ninjas, so, y’know… obviously. It was all I could do not to collapse in a hilarious heap. It was exhilarating to see someone so abandoned and wild and free. One of the things I have loved the most in our last 15 months living in New Zealand has been this sense of being nestled right amongst the mud and trees and birds. Whenever we are feeling a bit down we can just open the door and pick some fruit or climb a tree (time outdoors is one of the five best keys to happiness and we have really experienced that) and the girls are developing a whole education in the natural world. Ramona surprises me almost daily with little observations she has made about the animals that surround us, and then there’s Juno who mostly speaks Animal, with 3 or 4 perfect bird calls under her belt… amidst a tiny human vocab. Early last year a few of us got together and began an Outdoor Play Group – a group of parents and children that simply play in nature. It is pretty much the one thing in our week that we are committed to, every Tuesday we spend from 10-2 at our friends little slice of wilderness. 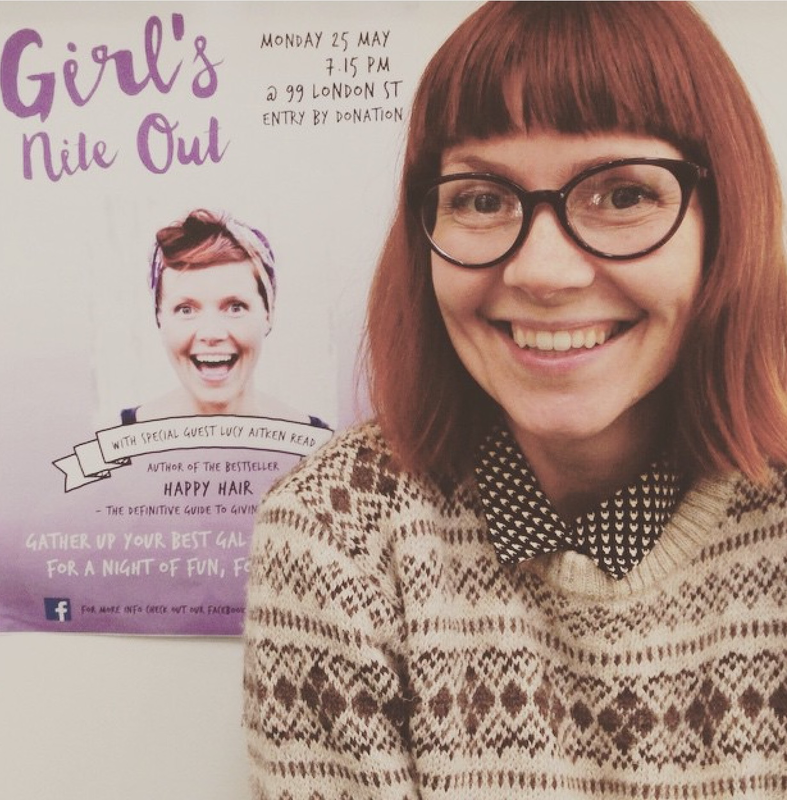 It is a hugely important part of our lives, where the girls can play uninhibitedly and where I get the chance to be nurtured by time and conversation with other parents. I’ve written before about the many, many reasons to get outdoors and play in the wild. I thought I’d put some ideas out there, that might help parents set up their own Outdoor Play Group. 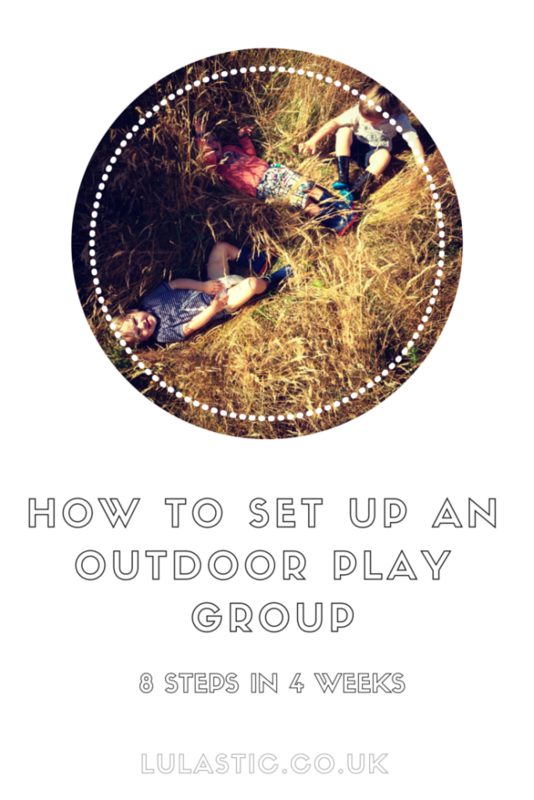 Here are 8 steps for setting up an Outdoor Play group – follow these and you could have your own group in a matter of weeks! Firstly check there isn’t an official Nature Play Group already in your area – you could be one of the lucky devils able to jump on board with one already rolling. 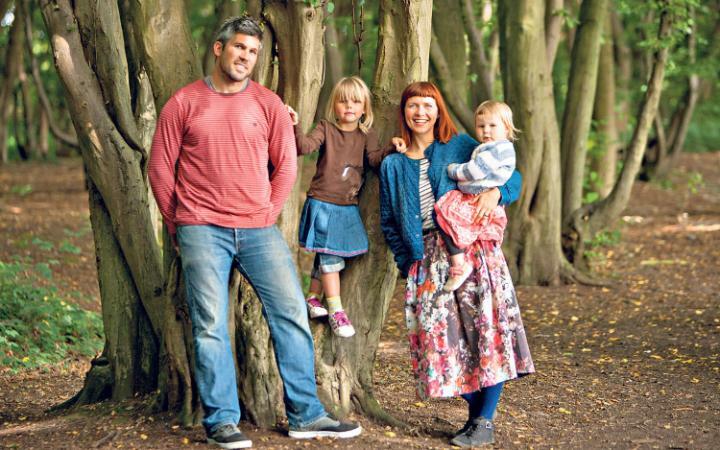 Clare Caro (she is an inspiration) has developed an organisation that is leading a well supported movement of Outdoor Play groups in the UK, under the banner Nature Play. Double check this list to make sure you don’t already have one near you. If you do, find out how to get involved through Clare’s web site. Find two friends who are interested too. I watched a video a few years ago that has stuck with me ever since. It is about how the first guy that jumps up to dance will stay just a loner until a couple of other dancers join him – then a movement begins. (Watch it here. It’ll make you smile!) This goes for beginning pretty much anything and everything. You alone are FANTASTIC but you need two friends to build momentum. Once there are three of you, you are good to go! Ask around your friendship group – you might be surprised who will commit to this with you. It is my experience that almost all parents are looking for ways to be more outdoors with their children. Ask wider Facebook groups to help you with your search – the Attachment Parenting and like minded groups admins might be able to help, as an example. Go offline- put little notices up in the library and at local Tots groups. Draw on your whole community to give your Outdoor Play Group a good boost right at the start. Get people (parents, La Leche group organisers, wise people, elders, any stakeholders) in a room to share your vision. Advertise this open meeting widely. This is a great way to pool resources, discover fresh ideas about location, and you could well end up with a list of contacts that might form your first attendees. Scout for a location. The UK and New Zealand are fortunate to have lots of little woods and reserves dotted around the place, or failing that little pockets of “nature areas” within parks. Ideally you will have a little grove of trees, with a small clearing amongst it, enough space to really roam and feel a little isolated from the busyness of a city, enough peace to be able to spot birds. We are lucky to have a little stream running through our area which makes for a great amount of fun in winter and summer. A tiny pond would also be great – as would, even, a tree-less beach. Is it free from buildings and human-made structures? It’s a winner. Even if it’s a public place, being in touch with the council about your plans could be really valuable. If you don’t have anywhere public try thinking about private spaces. There are privates gardens, or backyards of neighbours or stretches of land owned by trusts… get together with your team mates and start getting in touch with people. I am sure you will be surprised how many private land owners would be delighted to step in and help provide a beautiful space for your group. How hard can it be, right? Walk outside, play in the nature. Sort of. I like to think that there are some foundations for really free and beautiful parent-child time spent outdoors though. These include allowing play to be totally child – led. Giving space for children to work through challenges, and conflict. Clare has given a lot of thought to this and I massively recommend being inspired by these Nature Play Guidelines together. We introduced ukelele playing at our own Outdoor play group as a way for the adults to have fun, and to give the children more space to explore autonomously. We were finding that idle parents can spend too much time focusing on their children and almost interrupting their play. Find a day and a time that suits your core team. We do Tuesday 10 – 2/3pm because we all make lunch and eat together. The official London South East Nature Play group do 10-12 on a Thursday. Figure out the slot that will suit you three, trying not to overlap with another local group that parents might attend, and then let others arrange their timetable around you. Nothing’s really stopping you now, apart from other families joining you! Start a Facebook group and start inviting people to it, visit local tots groups and make an announcement at the end of each group, put flyers up around local venues. It can take 6 months to a year for a group like this to really build up. If there are three families committed to this you will be able to ride this bumpy first stage, as people come and go and get a feel for it. Soon enough you will be maxed out! Hooray! Here’s to your own mud bath, river paddling, weed ripping, fire toasting Outdoor Play group! A few months go we met up with an old family friend we hadn’t seen in yonks. We’d kept in touch, were really close and were excited about spending time together as we passed through her town. We only had her one hour lunch break so you can imagine our surprise, and sadness, that she spent almost the entire time letting us know in not-so-subtle ways that she was disappointed with what we had decided to do with our lives. She questioned our decision to live in an unconventional dwelling, telling us our yurt wouldn’t stack up against health and safety regulations. She berated us for not using our good degrees, wondering why we had settled for such simple employment. We knew some of our family and friends wondered about the same stuff, they’d let us know, respectfully, that they worried about our relaxed parenting style and lifestyle decisions. But we hadn’t ever been grilled for an hour, so upfront and disparagingly. But we got over it. Because we are one hundred per cent convinced that we have made the right decisions, to give up our jobs, to move across the world, to start living in a yurt, to buy land with another family, to parent in a consensual, rights-respecting way. We have reflected hard and researched hard and then followed our hearts, and we think this is the only way to do life. We are pretty sure footed about this path we’ve settled on. I had an email this week from a reader who is experiencing similar backlash about her and her partners desire to shake off the mortgage and hunker down for a more simple life. And it got me thinking about how common this is. People we care about letting us know that they don’t like our disregard for the status-quo. It got me jotting down a few thoughts. When I am feeling defensive about all of this, it is easy to say “Haters gawn hate” in my most badass voice. But the truth, I know, is that these people aren’t haters. This isn’t a post about all the anonymous folk that comment on Daily Mail articles about hippies weaving a house out of the old uniforms of veterans. This post is about the lovers in our life who don’t like the way we live. Our siblings, and besties, and cousins, and parents. And here is the thing. They love us. It is probably the main reason they tut or roll their eyes or outright berate us over lunch. It is easy to forget this when we are feeling got at. Sometimes it is hard to believe that love can ever look so reproachful. But it can. And we have to remember that. Why would people that love us want to criticize important decisions, especially ones that we have thought so hard about? They are scared for us. They haven’t ever seen people stray from the 9-5 working day. They worry that we will be left high and dry, age 93 without a bean to our name apart from dementia. If we come from well off families, it might look as if we are throwing off the responsibility that wealth can bring. If we come from hard – up families it might look as through we are chucking all their hard work spent raising us away. And also sometimes they are worried because they think they have seen this before. I recently read a book that looked at the macro picture of The Sixties and it was pretty revealing about how older generations might see our lifestyle now and worry about where it is going to lead. It is easy to look back on the sixties and think, oof, all those hippies had it SUSSED! But in their shrugging off of social norms they really did shrug off a lot of good stuff, too. For example, it seems as though part of their dive into sexual freedom meant they leapt away from commitment, and even, sometimes, consent. I think the liberal, progressive days of the sixties paved the way for today- where we are able to take radical concepts and run with them- so ‘nuff respect for that- but our parent’s generation see this and think we are going to end up like the burnt out, drugged up, love crumpled hippies of the Sixties. And they are scared for us. Are you able to pinpoint what people are afraid of, on your behalf? If so, you can reassure them, without having to change your decision making. This isn’t about having to explain yourselves, which can get tiresome in the extreme, but putting it out there, explicitly , that they do not have to be afraid. Sometimes I think people are worried that we have simply “fallen” into this lifestyle, that our parenting is simply accidental laissez faire, as opposed to being a parenting style we have researched DEEPLY. They think our lack of proper jobs is to do with not asserting ourselves, of accepting something less than our full potential. Often, we don’t have to actually explain our position, we simply just need a few choice sentences that can address those deeper fears. 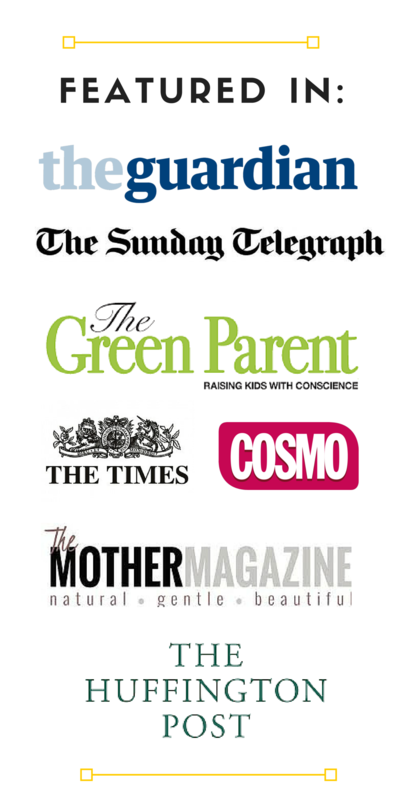 We have researched this extensively and believe this is exactly the right decision for us. This is intentional, not accidental. We believe this is the way we can fulfill our full potential. We are committed to our family’s safety. This is the way we can achieve full mental and physical well being for all of us. We have reflected upon the risks of this and are going into this with eyes wide open. We have a book that we sometimes call upon and give to people. It explains our parenting style from a philosophy which many of our family come from (Christianity.) Close family members can be very open to reading materials given to them, and this can be a much easier way of getting ideas across than through conversation. Having someone else explain something can validate it and articulate it better than our flustered, sometimes defensive, selves! This can lead to some quite open and honest conversation. There are loads and loads of reasons Tim and I have opted to stray from the mainstream when it comes to our parenting, our children’s education, our jobs, our home and, well, you know, whole life. Some of them include “because we have given a lot of thought to the idea of schools and think that, for the most part, they stifle learning, stampede over human rights and crush a child’s spirit” also “we don’t have 9-5 jobs because the idea that you are what you earn or that we must find value in being busy, busy, busy is a load of crap” HOWEVER… we don’t tend to say this out loud to many people, y’know? And then, when all is said and done, you are the one living your life. Only you and your family know the right decisions for you. There very much comes a point when we need to stand tall, with our feet on the foundation of our good decision making! We have researched, reflected, looked inside our hearts and out, and we are living the life that fits us alone! 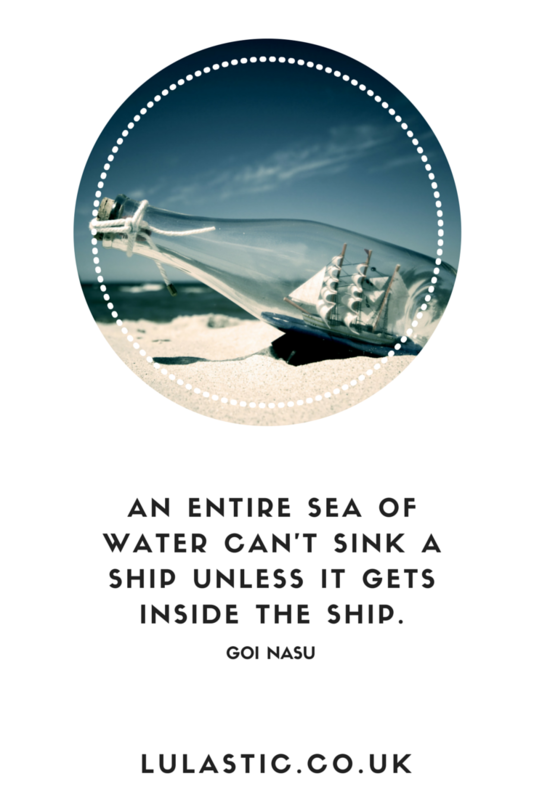 There is a beautiful quote, a slightly less street way of saying “Haters gonna hate” about how an entire sea of water can’t sink the ship, unless it is allowed in. What is going to help you batten down the hatches? To seal up the portholes and fill in the cracks? A tribe. A group of people who think like us! 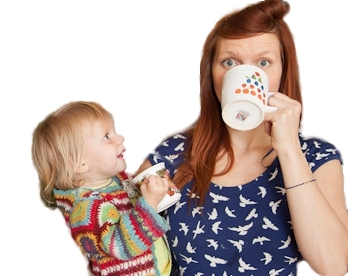 Who make our parenting look normal, our yurt look awesome, and our lack of office jobs look ideal. 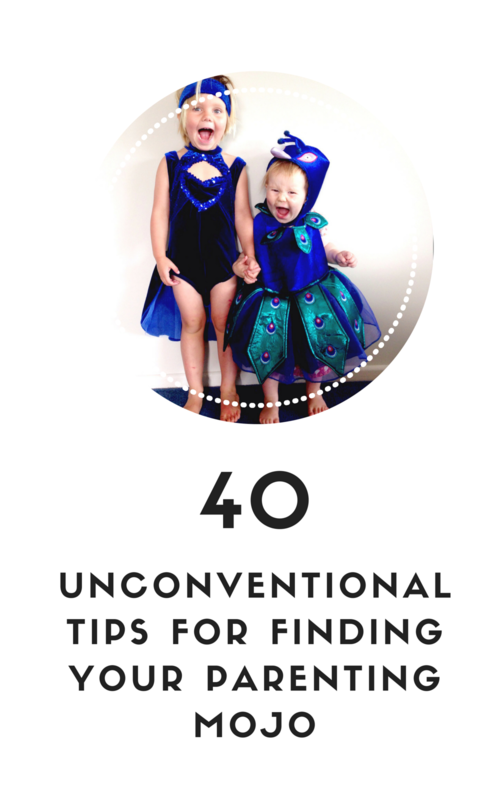 At various times in our lives this has looked like online forums, regular attachment parenting meet ups, bi-annual unschooling camps, even moving to a place where questioning the status quo is a healthy normal. 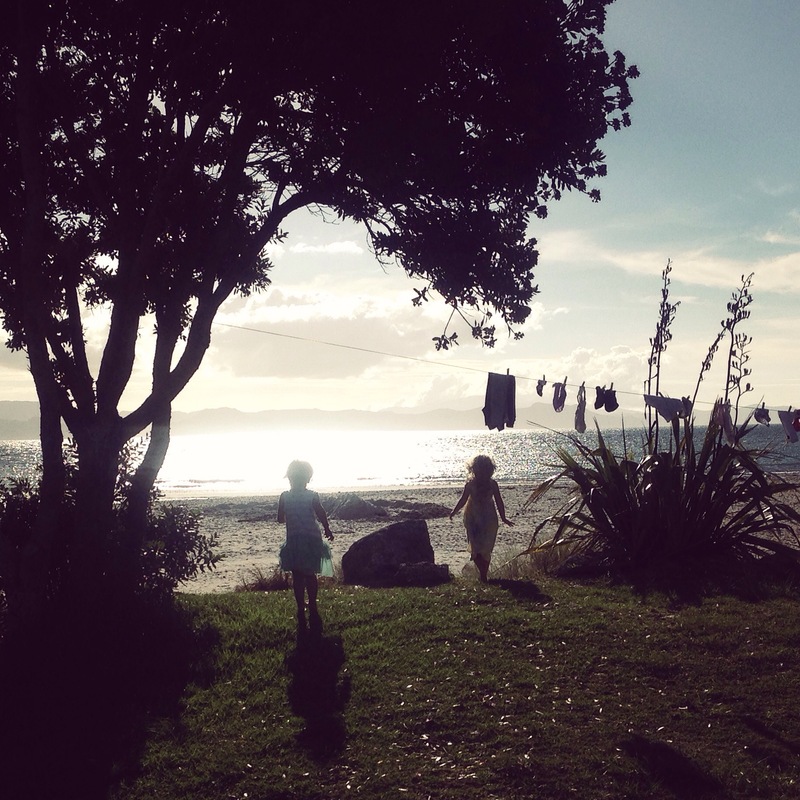 (Here in the Coromandel, New Zealand, living an eco, sustainable, progressive life is very common and it was a big reason we chose to move here.) Come on over and find a tribe at our Facebook page too.. This is our friend’s beautiful yurt. We actually know tons of people that live in buses or tents or handmade homes – life can be very good without enormous mortgages. Lots of information. I am zealous about books and studies. I read and read. I keep up with neuroscience so that I can explain the importance of attachment, I keep up with the baby mortality stats so that I can counter any argument to cosleeping, I read everything I can about how children learn, I get my head around the unsustainability of our current housing situation and seek to understand what are the fundamentals for happiness and well being. I RARELY pull these out of my quiver and fire them – it might be tricky to do so uncombatatively! But for my own sake, this all helps me feel confident in the choices we are making. I want to just take a second to validate you. It’s going to be a slightly emosh second as I am feeling quite full of heart that you are here, reading this, one of us … You aren’t alone… we are all here and we can cheer each other on. If you are questioning the mainstream and seeking to live a life that takes less of a toll on the earth, you are of a crowd that is going to go down in history, that will be thanked by our grandchildren’s grandchildren! They shall call you a legend. If you are making presence and peace and love your ambition, and don’t really have two pennies to rub together, you are rich. If you are nurturing your child’ spirit, determined to let them spread their wings, to live as partners in this dance of life, if you choose empathy over control, you are nourishing a generation that will take this love and build a new world with it. I am sure I have only scratched the surface of this topic! I would be absolutely stoked to hear some of your own thoughts on this hefty topic. 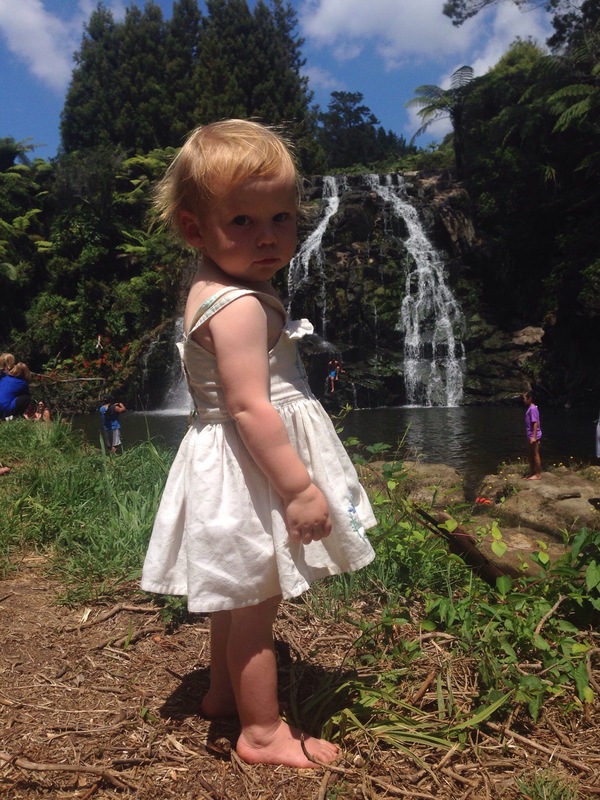 You know how we moved to New Zealand for this sort of wild and free and outdoorsy life? And then we kept looking and looking for a bit of land to put our roots down? And then couldn’t find anywhere and it felt like things just weren’t really going to plan? Well, meanwhile, we were living in our yurt on an organic farm and learning an awful amount about farming and living sustainably, and how not to dye the chickens bright pink, and also making firm friends with the other families that live here. One of the families has a brood of children, and they unschool too, and we share many other values, and they have also been looking for a forever home. About halfway through last year we realised that we could, and should, do all of this together. 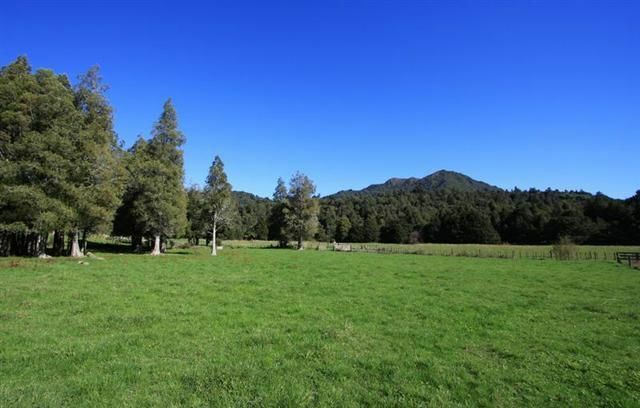 And then, exactly one year to the day that Tim and I moved here we looked at this piece of land on a river, in one of the North Island’s most spectacular spots, the Karangahake Gorge. And we were like; Woah. This is the one! 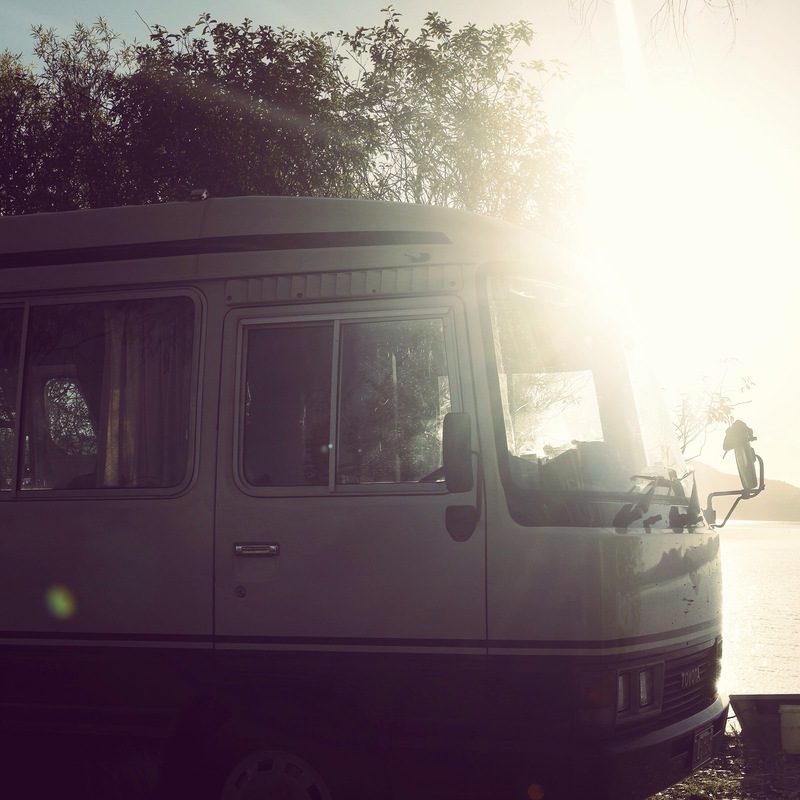 It was ticking all the boxes we’d given up on – having a river to swim in, lots of forest, lots of flat, affordable. It is surrounded by Conservation Land, and a swing bridge from the corner of the property takes you over the river into some forest and small mountain ranges hundreds of miles big. So we bought it! Halfsies, with our friends. And today it goes unconditional! And we move there in the Spring! When people hear we are going to be sharing this Dingly Dell they tell me about their best friends who bought together and then one of them chopped the other’s ear off, or that community that internally combusted due to communal mouldy potatoes. I’m absolutely not denying it is hard, sharing life like this. We know so, so many people dream of it and it doesn’t work out. We realise it could well not last forever. But we are really committed to the idea, to bringing our children up in a tribe, to working together to live as sustainable life as possible, so we are going to really try and live this dream. So YIKES AND YAY!!!!! We are planning now, and dreaming, and THIS SHIZZELMCNIZZEL JUST GOT REAL!